The University of Maryland has named Laurie E. Locascio as its new Vice President for Research, effective October 1, 2017. In this role, Locascio will be responsible for sustaining strong growth and excellence in the university’s research programs. For the past 30 years, Locascio has worked at the National Institute of Standards and Technology (NIST) in Gaithersburg, Md., rising from a research biomedical engineer to senior leadership positions. 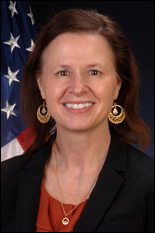 Locascio is currently acting as the Principal Deputy Director and Associate Director for Laboratory Programs at NIST providing leadership and operational guidance for NIST's seven scientific and mission-focused laboratories.